Woh … to your casual wine drinker that name is both long and confusing. What the does it mean? I’m going to cover the edumacational stuff first so some of you more sophisticated and knowledgeable (than I) fellow wine wankers may wish to skip the next paragraph or two. Note that in all my posts I try to apply links to highlighted key words and phrases that will direct you to further information if you’re keen. Cerasuolo di Vittoria is Sicily’s only DOCG and it relates to red wines known for their vibrant colour and perfume that come from Sicily’s south-east coast. Let’s call it “the style” of the wine based on “the rules” of the DOCG. And being a Classico means that it is a theoretically superior wine within the DOCG that follows traditional methods. 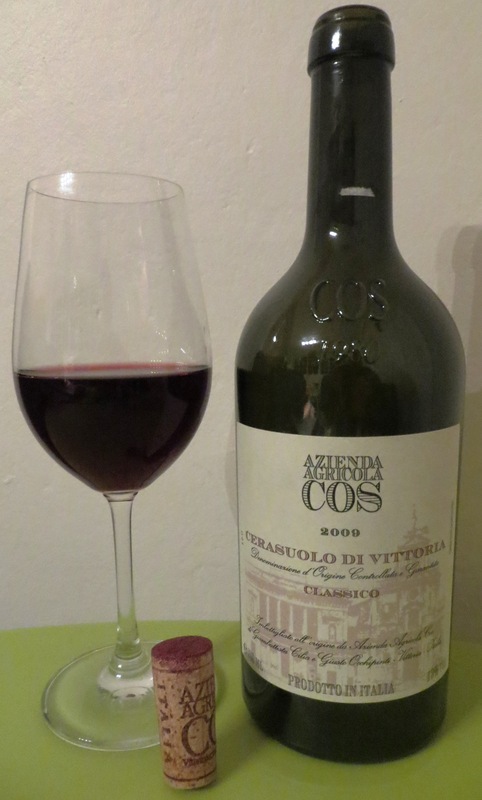 Azienda Agricola COS are the producers of the wine and have an interesting history themselves. They also produce a number of other interesting wines including a 50% Inzolia, 50% Grecanico (hmmm). The Cerasuolo di Vittoria is a blend of two grapes native to Sicily, being 60% Nero d’Avola and 40% Frappato. Nero d’Avola is arguably Sicily’s most important grape. It is known to produce full-bodied wines in a similar style to Australian Shiraz. Frappato is another Sicilian grape used to make light red wines and only makes up about 1% of all vines on the island. Together they are typically blended to form Cerasuolo di Vittoria which is usually a medium-body wine that obtains the floral and perfumed notes from the Frappato and a relatively robust structure and flavour from the Nero d’Avola. I recently won this wine at Auction for $30, a decent score considering that it is quite a rare wine here originally selling for $46, although you can pick up the 2010 for about $47 online. I had read reviews that this was an interesting and somewhat “different” wine so when it came up I had to get some. As soon as I opened this bottle I got an intense whiff of Black Forrest cake. The whole set of aromas on the nose were strange but also inviting. I kept on sniffing, it definitely smelt different and I was attracted by the light perfume. I even got a bit of musk in there with those cherry and chocolate smells. On the downside, it did remind me a bit of red medicine and that was probably the cherries. On the taste, it was just so strange! The palate was much more raspberry than cherry, and then there was an over-encompassing taste of blackcurrant. I asked my wife what she thought and she said that it didn’t taste like a normal red wine and reminded her of Ribena, a common soft drink based on blackcurrant (although the wine is neither fizzy nor sweet). The interesting fruit was followed by what I could only describe as mushrooms growing out of a mix of wood, tobacco and earth but the wine wasn’t tainted. And all the while there’s the strange but intriguing scent on the nose. My wife cooked up a simple but lovely rice and beef mince dish with a red wine sauce and mushrooms. This was exactly what was needed as I discovered that this was truly a food wine and the dish brought out all the flavours in combination with those in the food. I asked my wife again what she thought when it was combined with the meal and she said it still reminded her of Ribena! We only drank half the bottle on the first night and polished it off the night after, along with left-overs from the night before. It had definitely developed and opened up over the 24 hours or so. I got slight hints of fresh banana, but not in an amyl-acetate “fake candy banana” poorly made wine way, and even some Vegemite on the nose and it tasted far less berry driven and had a lot more earthy and savoury flavours, which I actually enjoyed. And I asked my wife if she still saw Ribena and she said “no, it’s alright”. That meant she was now ok with the wine. It was definitely an interesting and subtly complex wine but with a short to medium finish, although it seemed longer on the second night. Looking online it seems that others have had a similar experience to myself and many have enjoyed the wine. To be honest, I still can’t really work this one out and it has been doing my head in ever since hence why I decided to write about it. My wife wasn’t too fussed with it, but happily sipped away and enjoyed it more the second night. One could easily dismiss this wine as faulty but I believe, like others who enjoyed it, that there was nothing technically wrong with it although it was a bit bizarre. I’ve got another bottle of this and it will be interesting to see if I have the same experience. This wine reminded me of the time many years ago when I first tried straight varietal Malbec. Not so much because it tasted similar but because it was one of those “different wine” moments. I totally recommend this wine to anyone who has the open mind to try something a little different, and I think even a more recent vintage will give a similar experience, but make sure you decant it a little and match it to a beef and fungus driven dish! I won’t forget this wine, which is what experience with wine is all about. Had another one of these as part of our Italian wine and pizza party and it was even better the second time around. I really like this wine as did our guests. Read about it by clicking here. Next Oops… I did it again. Yes! Wine doesn’t have to be great to be interesting and worthwhile. Yeah totally! In this case I actually quite enjoyed the experience just because the wine was so different. I am looking forward to having the other bottle. Definitely a winery to follow! Where did you find the Frappato? I’d love to try that varietal straight just to confirm my thoughts on where the strange array of characteristics in the Cerasuolo di Vittoria actually come from. I’m guessing it was quite aromatic and fragrant although light? I’d love to get my hands on COS’ 50% Inzolia, 50% Grecanico wine. It sounds like an interesting white wine blend. Yep, I’ll have to source more of their wines. And I look forward to reading your write-up. Yes, it was aromatic and light. Found it in Perth at a shop called Re-Store. This wine has been described as “a wine geeks wine”. Quite fitting. I think the whole spirit of this wine (as well as of the absolute majority of Italian and Old World wine in general) is better understood when it is paired with proper food, and in my opinion your wife made a perfect choice. Too right Ana! This was totally a food wine and, luckily for me, my wife is a great cook, mostly. I hope you come by and visit us from time to time. Engaging Post! Thanks again for the visit to Narc. No worries. I enjoy your interesting writing. Cheers! Sicily is indeed coming with some good wines these years after the young generation started pulling out old vines and replace them with nobler grapes like they did in Toscana (Sassicaia) back in 1948! Yes they definitely are. This was a good wine! Oops, I might have made a mistake (I need some Japanese sake quick! ): I called you Stuart! Is it Conrad or Stuart? Hi Amanda. I just read a few of your 36hr posts and am going to point Neal, one of our bloggers, in the direction of your blog as he is off to Chile and Argentina in a couple of weeks. Cheers! Great wine and fine producer. 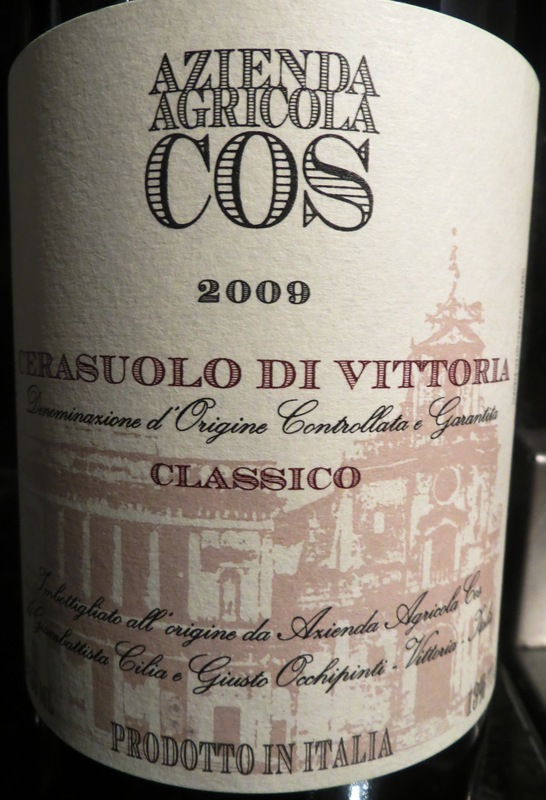 I visited Cos several years ago and had a fantastic tasting and lunch at the winery. That sounds great. I’d love to taste a full range of their wines. I’ve only heard good things. I tried the Pithos Bianco from COS, it’s a white wine vinified like a red wine. Interesting is definitely the word ! looks good who imports it?